The British filmmaker's latest, and how it fits into his oeuvre. Possibly the film event of the summer, Christopher Nolan’s Dunkirk has been long anticipated by fans and critics alike. Dunkirk marks Nolan's first film since 2014’s Interstellar and is a departure from his previous excursions. It is the first Nolan movie based on historical events, as all of his other movies have either been original scripts, remakes, or literary or comic book adaptations. Dunkirk is instead a portrayal of a particularly poignant historical event of WWII - the ‘miracle’ of Dunkirk - and concerns the battle between German soldiers and Allied troops that lasted for 10 days in 1940, and which ultimately led to the evacuation of more than 330,000 Allied troops. This history is recent enough to have some survivors of the actual evacuation present at the premiere of the film. The action (the film has surprisingly little dialogue) is seen from the land, from the sea, and from the air, and concentrates what would be thousands of personal stories into a handful of characters and their heart-stopping efforts to reach the safety of British shores, faintly visible on the horizon, yet frustratingly out of reach. The title Dunkirk itself is divided into three segmented colours - sky blue, dark blue and orange - referring to the triptych plot of Air, Sea and Land. Nolan departs from the conventional narrative framework of a war movie - the boot-camp training, family life disrupted, comrades supporting each other in battle and so on - and plunges us immediately into the middle of the action. But here again Nolan plays with time, using three intercutting stories in three different time frames to tell his story: the beach with the infantry (including Kenneth Branagh, Fionn Whitehead and Harry Styles), the evacuation by the navy requisitioning civilian vessels (featuring Cillian Murphy and Mark Rylance) and then in the air (with Tom Hardy engaging in aerial dogfights). With regard to the Battle of Dunkirk's importance, he added: “This is an essential moment in the history of the Second World War. If this evacuation had not been a success, Great Britain would have been obliged to capitulate, and the whole world would have been lost, or would have known a different fate: the Germans would undoubtedly have conquered Europe, and the US would not have returned to war. It is a true point of rupture in the war and in the history of the world. A decisive moment. The success of the evacuation allowed Churchill to impose the idea of a moral victory…Militarily it is a defeat; on the human plane, it is a colossal victory." After hearing first-hand accounts from the survivors of the Dunkirk evacuation, Nolan realised how young and inexperienced many of the soldiers had been, and so decided to cast mostly young and little-known actors for the beach setting, bringing home the idea of young men cut down at the beginning of their lives, and the terrifying waste and indifference of war. This is balanced out by the experience and skill of the more seasoned members of the cast. Long-time Nolan collaborators such as Murphy and Hardy, but also some of the most celebrated British thespian talent, including Rylance and Branagh. Rylance’s performance again astounds by its naturalness. Without a spare gesture or sentence, Rylance can communicate a range of quiet and subtle emotions - unlike other actors, even some of the best, one is never conscious of his ‘acting’. Because the film has minimal dialogue, Nolan also found it useful to investigate silent films to see how they handled crowd scenes and what kind of techniques were used to maximise the feeling of awe and suspense. He decided to use the real naval destroyers for the sea battle sequences (there were 62 ships in use during filming), cardboard cut-out props of soldiers and military vehicles placed in the far background of shots, to create the illusion of a huge army. What is unique about Dunkirk, is not just that Nolan can assemble a stellar cast, but also that he has the clout to choose the methods he wishes to employ to get the effects he wants, and he can also insist that he shoots on film, an increasing rarity. Rarer still is that he can get 70mm film prints to play in theatres, requiring them to find a real live projectionist. The film is also Nolan's sixth collaboration with composer Hans Zimmer, who delivers an unusually restrained score. (They previously worked together on The Dark Knight Trilogy, and Zimmer received an Oscar Nomination for both Inception and Interstellar). Dunkirk clocks in at 107 minutes (the director's second shortest film to date) but it is edge-of-your-seat filmmaking, focussing on the deeply moving efforts of soldiers to survive the onslaught. The tension never lets up. 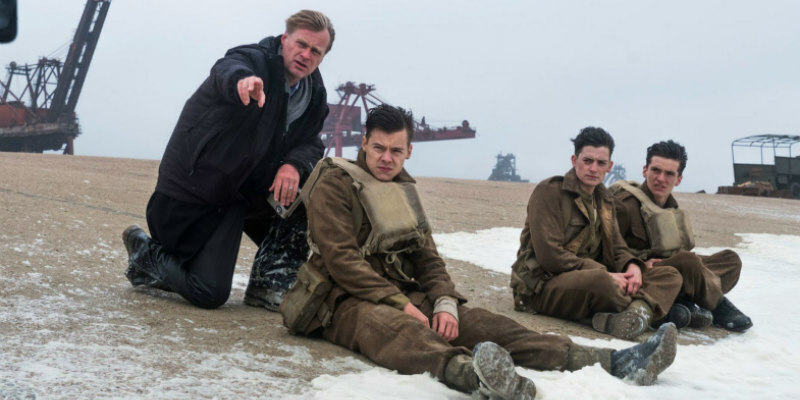 The film has been described as “one unending big moment,” and the decision to shoot on 70mm “delivers a completely immersive and intense experience that you can’t get on a traditional digital print.” Dunkirk is the type of story that exploits the scope of the format. Warner Bros is busy proclaiming that Nolan’s WWII epic will be the most widely released 70mm film in 25 years. Dunkirk will also show in IMAX auditoriums, but unlike typical studio fare that is ‘up-converted’, much of the film was actually shot using the IMAX process, usually reserved for high-quality nature documentaries. IMAX cameras not being the nimblest to use, film buffs will know this is unusual territory, especially within today’s ‘download- to-your-phone’ conditions. On 70mm the film was impressive; the IMAX screenings are bound to be utterly immersive. Unsurprisingly, Dunkirk’s cinematography has been highly admired, the aerial photography being especially thrilling. New collaborator Hoyte van Hoytema (who replaced long-time DP Wally Pfister on Interstellar) may be singled out for praise for some inventive camerawork. But where might his newest venture fit within Nolan’s body of work? Nolan has become known for his innovative approach to storytelling and the originality of his ideas. He uses methodically structured timelines in keeping with the ambiguous nature of his films, which often require repeated viewings to become ultimately satisfying. His debut Following (1998) was made on a budget of around £6,000, but along with his subsequent critically-acclaimed films, Memento (2000), The Prestige (2006) and Inception (2010), the movie was seeking to explore and extend the limits of film structure and technique. In all of these works, Nolan refused to provide his audience with definitive conclusions, preferring instead to encourage them to extract their own meaning from endings which remain ambiguous. In Dunkirk, however, Nolan is dealing with a story whose ending is famously known, so instead he arranges the time frame in a way that highlights the plight of the individual’s need to survive, and the trauma and consequence of being caught up in violent, life-changing experiences. To make it clear how battle can appear different from the air than it does on land or on the sea, the audience's perspective is shifted from one to the other, informing our understanding of how one’s proximity to violent or harrowing scenes may affect the choices we make. Dunkirk reinforces Nolan’s commitment to celluloid, and increasingly to IMAX, one which offers the audience an enhanced experience of film - "something special, something extraordinary" as Nolan insists. Nolan also has a canny awareness of the advancements in technology for the dissemination of his films as well as for offering opportunities for interacting with an audience. At the same time, he is striving to advance the traditional craft of filmmaking. A consummate filmmaker, he eschews CGI and a second unit, overseeing all aspects of production, preferring to shoot the entirety of the film himself to maintain full control of his artistic vision. He is also concerned about the experience of cinema for the audience - "There’s a very real danger in watering down the theatrical experience… and with the confusing proliferation of digital technology, there isn’t any stable digital archiving medium." Cinemas must "drastically improve" or lose audiences, he warned when discussing the potential ‘death of film’. Not an event likely to occur too soon while he and a handful of other directors continue to work within the medium. In Dunkirk Nolan again brings his assured and very distinctive vision, this time to a real-life story, creating an epic and gut-wrenching cinematic spectacle, yet also at times managing to remain affectingly intimate.